This stunning image of NGC 1275 was taken using the NASA/ESA Hubble Space Telescope's Advanced Camera for Surveys in July and August 2006. 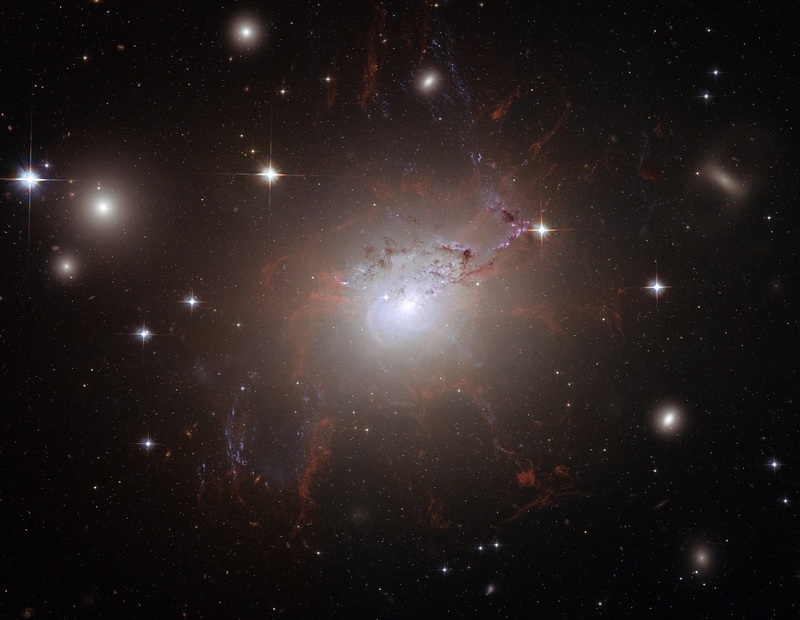 It provides amazing detail and resolution of the fragile filamentary structures, which show up as a reddish lacy structure surrounding the central bright galaxy NGC 1275. These filaments are cool despite being surrounded by gas that is around 55 million degrees Celsius hot. They are suspended in a magnetic field which maintains their structure and demonstrates how energy from the central black hole is transferred to the surrounding gas. By observing the filamentary structure, astronomers were, for the first time, able to estimate the magnetic field's strength. Using this information they demonstrated how the extragalactic magnetic fields have maintained the structure of the filaments against collapse caused by either gravitational forces or the violence of the surrounding cluster during their 100-million-year lifetime. This is the first time astronomers have been able to differentiate the individual threads making up such filaments to this degree. Astonishingly, they distinguished threads a mere 200 light-years across. By contrast, the filaments seen here can be a gaping 200 000 light-years long. The entire image is approximately 260 000 light-years across. Also seen in the image are impressive lanes of dust from a separate spiral galaxy. It lies partly in front of the giant elliptical central cluster galaxy and has been completed disrupted by the tidal gravitational forces within the galaxy cluster. Several striking filaments of blue newborn stars are seen crossing the image.